It's true: When Harry Lorayne teaches on camera, it's almost as if he's sitting with you in your own living room, helping and guiding you. It will be hard for you to decide which you enjoy more - the performances or Harry's explanations. As he teaches a particular routine, he also teaches each sleight, each move, the psychology, the proper attitude to take. 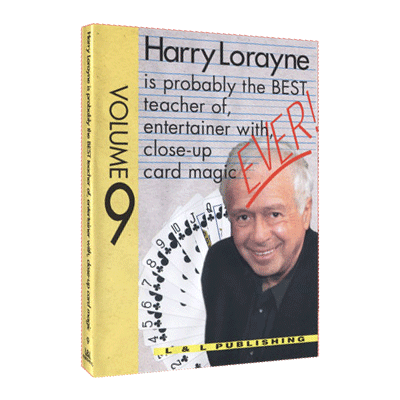 Watching Harry Lorayne is watching impromptu close-up magic at its best. Each and every effect, idea, routine in this entire series can be done with a borrowed deck of cards. You'll be thrilled by Harry Lorayne's performing/teaching ability, by his judgment, selectivity, attention to detail. Harry never abandons you during an explanation; whatever he teaches, he teaches thoroughly, walking you through it hand in hand. Be prepared to sit, watch, enjoy - and learn! INTER-DIMENSION (Eddy Taytelbaum) - An anywhere, any time, little gem of card magic. Look at Harry's performance only; you'll be badly fooled. Then learn this easy-to-do little miracle. TWO GAMBLERS & A MAGICIAN (Randy Wakeman) - Harry takes the "magician versus gambler" theme to new levels, new plateaus, new dimensions. A killer routine. SNAP! - Here's the rubber-band effect that started the whole rubber-band-trick craze. The linking, the penetrating, etc., all came about after Harry's Snap! It's been ripped off, imitated, "variationed," from here to summer and back again. But nothing compares to the original. See it done right, learn it right. LORAYCES (Tim Wenk; Harry Lorayne) - You'll locate the four aces as nobody has ever located them before -with any deck. All of Harry's incredible routines are done with a regular deck. WATCH ME WORK (Randy Wakeman; Harry Lorayne) - A gambling demonstration that "rings true." Your audience will believe and enjoy, and marvel at, every exciting moment of it. SANDWICHANGE - Typical Lorayne. The wrong card is seen to be between a pair of mates. It never leaves that position yet, it magically changes to the "right" (the selected) card. SANDWICHANGE FOR HOFZINSER (Meir Yedid) - Then, use the same easy maneuver for a Hofzinser routine that has stood the test of time. So much better than the original! LORAYNE BLUFF COUNT - It's a "bluff" but, boy, is it a good one. Four of a kind changes to a different four of a kind in an instant. THE MOVING PENCIL - Probably the best "special kind" of force ever devised. It's been used and copied by cardmen all over the world. The routine lets your spectator do the magic. MULESHOE GAMBLER - This routine stands head and shoulders above probably every gambling demonstration, with a regular deck, ever thought of, devised, invented, published!